The Open Door Classroom: 5 Kinds of Number Stories Posters FREEBIE! 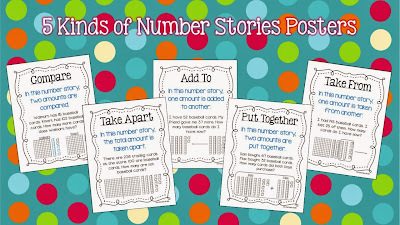 5 Kinds of Number Stories Posters FREEBIE! Do your students struggle with tackling number stories? This is an area of math that my students always have difficulty with. In the new Common Core standards, it says that students need to be able to solve one and two-step word problems involving situations of adding to, taking from, putting together, taking apart, and comparing. To help my students with these problems, I decided to explicitly teach the five types of number stories. I created a poster for each kind and we did a lot of practice identifying the 5 types in various word problems and discussing which operation to use to find the answer. This has made such a difference for my students! Number stories are no longer a mystery for them and they are able to tackle them much more easily. I found your blog when I signed up for a giveaway from What I Have Learned. I think your blog is SUPER cute. I teach first grade, but think that these posters will work great for us teaching the different ways to solve word problems as well. I TRY to do one a day, but you know how it goes....some days we fall behind. Anyways, I am now following you and think you have some great things!